Firstly they ran aground before even leaving the harbour, then they had to wait until the winds picked up again, and they also encountered a whale and pirates! But that was nothing compared to the storm they would face once their voyage had begun. This fragment in the Whitley Beaumont archive ends here, but an account of the voyage by Charles May, the mate of the Terra Nova, published after their return provides an account of how the crew overcame the storm damage and bears out the events illustrated by the sketch. All the animals on board as food were swept away, so there was food rationing and an attempt to consume animal hide. A few days after fixing the rudder they came upon another storm, which took down the mast and ruined their main sail, but luckily they repaired the mast and made a new sail out of various materials and continued on to return home safe. Four months after they sailed, the Terra Nova arrived at Plymouth. Ten days before the Terra Nova sailed, King James II of England had been deposed in the “Glorious Revolution” – too little time for news to reach the West Indies. While the ship was being beaten by storms, England had an Interregnum, until 12 February 1689, when William of Orange and Mary, James’ sister took the throne jointly. Captain Beaumont would have landed at Plymouth in April to find everything at home had changed in the 4 months he was at sea. 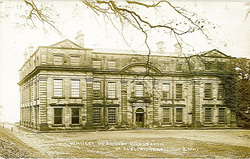 The Whitley Beaumont archive documents the lives and activities of the Beaumont family over 800 years and illustrates the richness and variety in major family and estate archives. View the collection on our ﻿online catalogue﻿.